Ellenbrook Fields is a 400-acre country park on a former aerodrome site situated between Hatfield and St Albans. 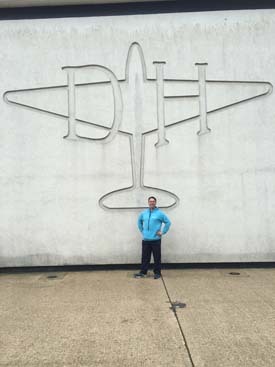 The land was originally farmland before becoming part of the de Havilland (later British Aerospace) airfield at Hatfield. Hatfield Aerodrome was a private airfield and aircraft factory from 1930 until its closure and redevelopment in the 1990s. Geoffrey de Havilland, pioneering aircraft designer and founder of the de Havilland Aircraft Company purchased farmland close to Hatfield as his existing site at Stag Lane, Edgware was being encroached upon by expanding housing developments in the London suburbs. In 1934 significant works were undertaken at the site and a large factory and imposing Art Deco administration buildings were constructed together with a flying school building which also housed flying control. During the Second World War, de Havilland was most noted for its Mosquito fighter-bomber, the famous ‘Wooden wonder’. This was developed privately at Salisbury Hall, outside of Hatfield to avoid being targeted by German bombers. The Hatfield site itself was camouflaged but was bombed on 3 October 1940 by a Junkers Ju 88. Four bombs hit the ’94 shop’ building, killing 21, injuring 70 and disrupting work on the Mosquito. Postwar expansion of the facilities was called for by rapid development of military and civil jet aircraft such as the Vampire and Comet. The de Havilland Aircraft Company was acquired by Hawker Siddeley in 1960 and the de Havilland name ceased to be used in 1963. Hatfield once again changed ownership when Hawker Siddeley was merged with the British Aircraft Corporation and Scottish Aviation under the Aircraft and Shipbuilding Industries Act to form British Aerospace in 1978. In 1992, due to severe financial problems, British Aerospace announced the cessation of aircraft production at Hatfield from 1993. Friday, 8 April 1994, was Hatfield’s last day as an airfield, a DH Chipmunk – the type that had made the first landing on the new runway – was also the last plane to take off from it. The redevelopment of the main airfield site commenced in the late 1990s. The airfield closed but was later used as a film set for Saving Private Ryan and the television series Band of Brothers. Only the listed flight test hangar and administration buildings were retained, all other buildings, taxiways and runway were removed to make way for new offices, businesses and homes. Today the flight test hangar survives as a leisure centre, whilst the rest of the site is divided between the University of Hertfordshire, housing and a business park. 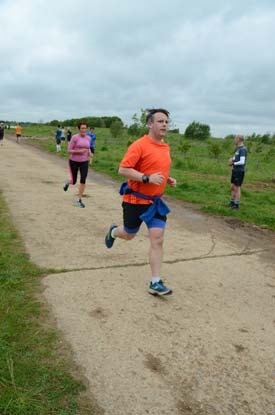 I accompanied Other Dan to the inaugural Ellenbrook Fields parkrun with Other Dan picking me up from Hanger Lane for the reasonably short drive to Hatfield. 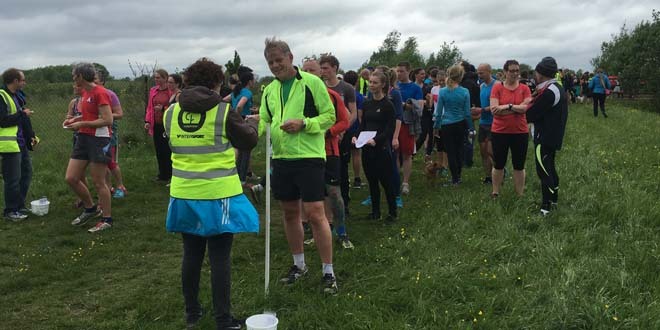 We rarely attend inaugural events – the high attendance can feel too demanding for the new event team, it has the potential to cause problems for the local environment, and as a parkrun tourist you don’t really get a feel for the community of the event. In this instance the new event team were welcoming for tourists to visit the inaugural, we were both available for a short road trip, and the location was reasonably close with a quick journey. There is ample free parking available in the University of Hertfordshire car parks and it’s a short walk across to the park land. The finish funnel is close to the park entrance and it’s where people were leaving their tops and assorted personal belongings. There was a marshal sitting in the areas and mother marshals seemed to be around when runners passed so it seemed to be a safe location. We congregated further down the ‘runway’ at the start line for the pre-run briefing where we were warned to be careful in some rutted areas and also given feedback that the test event runners found the long finishing straight deceiving so don’t go for the sprint finish too early. The run started with the route taking us out on a small loop (tarmac and grass) before a big loop (tarmac, grass, and trail path) took us round the site and back up the ‘runway’ to the finish. The warning about the finish straight was spot on – it’s close to a km of straight tarmac running up to the finish funnel so definitely don’t go haring off at this stage. Other Dan had left me to pootle round while he tested his legs so was chatting away to someone by the finish area when I finally appeared. There was a coffee van close by so I grabbed a cookie for the *cough* strenuous walk back to the car. It was nice to visit a new parkrun and feel the buzz of an inaugural event again so thanks to the new team and good luck as they build a new parkrun community.